April is the time to hop down the bunny trail toward an egg hunt, searching for a basket full of spring. Eggs come in dozens, but we’ve gathered 14 hunts, bunny sightings and other spring activities in the Hartford area, listed in chronological order. Always check the websites in advance for changes in schedule or rain dates. April 12 from 6:30 to 8 p.m. on the Windsor town green. Bring your own flashlights and baskets. Ages 1 to 12 welcome. Easter Bunny photo ops. Free. 161 Broad St. windsorcc.org. April 13 at 10 a.m. at Riverfront Park, 200 Welles St. in Glastonbury. More than 6,000 eggs will be hidden, each with a treat for dogs and their humans. $10 per dog. Dogs must be on leash with rabies tag or certification. glastonbury-ct.gov. April 13, Lyman Orchards, 32 Reeds Gap Road in Middlefield. A full day of activities: a search for apples in a hay maze; a magic show, pie-eating contests, face painting, pony rides and horse-drawn wagon rides. Every child who hunts for apples receives a T-shirt. Timed hunts, by age: 10 a.m. for ages 1 to 3; 10:35 a.m. for ages 4 to 6; 11:10 a.m. for ages 7 to 10; 11:45 a.m. for ages 1 to 3; 12:20 p.m. for ages 4 to 6. Parents may follow their children in the two younger age groups, but no parents are allowed in the 7- to 10-year-old group. $8 per child, $1 per child discount if three or more children. Additional charges may apply for other activities. lymanorchards.com. April 13, Farmington Polo Club, 152 Town Farm Road. 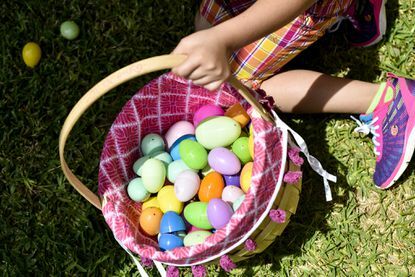 10 a.m. to 1 p.m . Farmington hosts its 41st annual Easter Egg Hunt with three egg hunts, live music, food trucks, vendors, bunny photo ops, and story times with Miss Connecticut Bridget Oei and the Hartford Yard Goats. The hunts are at 11:30 a.m. (ages 0-2); 11:45 a.m. (ages 3-5); and noon (ages 6-10). Free admission with an item to be donated to the Farmington Food Pantry. The hunts are at facebook.com. April 13, 14, 19 and 20 from 10 a.m. to 4:30 p.m. at the Connecticut Trolley Museum, 58 North Road in East Windsor. Easter Bunny Fun Days has Easter Bunny photo ops. Complete a scavenger hunt to get an egg with a surprise inside. Unlimited trolley rides. $13, $12 seniors, $11 ages 4 to 12, $4 for 3 and younger. ct-trolley.org. April 13, 14 and 20, at 10 a.m., 12:15 p.m., 2:30 p.m. and 4:45 p.m. at Railroad Museum of New England, 76 Watertown Road, Thomaston. A 75-minute train ride through the woods, with the Easter Bunny, to his private Bunny Patch to save his duck friends. $20, $18 child and senior, $1 younger than 3. rmne.org. The Farmington Miniature Golf & Ice Cream Parlor hosts an Easter hunt with 15,000 eggs on April 20. April 13 and 15 at 10:30 a.m. Stew Leonard’s, 3475 Berlin Turnpike in Newington, hosts a buffet breakfast with the Easter Bunny that includes photo ops and kids activities. Ages 2 to 12 $12.99; over 12 $14.99. Reservations required. On April 16 at 4 p.m. Stew Leonard’s hosts an Easter Extravaganza for kids 8 and younger. Each child gets a map of the store and a bag to collect treats from costumed characters. Easter Bunny photo ops. Free, but ticket required. stewleonards.com. April 19 from 10 a.m. to 2 p.m. at Harry C. Barnes Memorial Nature Center, 175 Shrub Road in Bristol. Also farm animals, face painting, Easter Bunny photo ops. $7. elcct.org. April 19 from 11 a.m. to 1 p.m. at New England Air Museum, 36 Perimeter Road in Windsor Locks. For ages 1 to 10. When each child has found a red, blue, purple, green and yellow egg, they trade them for a goody bag. Limit of five eggs and one prize per child. Bring basket. Parents must stay with kids during hunt. Easter Bunny photo ops from 10:30 to 11 a.m. and 1 to 1:30 p.m. Free with museum admission: $15, $14 seniors, $10 ages 4 to 14, 3 and younger free. neam.org. April 20 at Farmington Miniature Golf & Ice Cream Parlor, 1048 Farmington Ave. More than 15,000 Easter eggs filled with chocolate and prizes. 11:15 a.m. for 2 and younger; noon for 3- and 4-year-olds; 12:45 p.m. for 5- and 6-year-olds (no parents allowed); 1:15 p.m. for 7-, 8- and 9-year-olds (no parents allowed); 2 p.m. for sensory-friendly and all-accessible (adults as needed). Also face painting, bounce house, Easter Bunny photo ops. Admission is a $3 donation to Our Companions Animal Rescue. farmingtonminiaturegolf.com. April 18, 12:30 to 2:30 p.m., New Britain Youth Museum, 30 High St. Egg hunt. $2, children younger than 3 and members free. 860-225-3020. April 20, 10 to 11:30 a.m. and 2 to 3:30 p.m. Hungerford Nature Center, 191 Farmington Ave. in the Kensington section of Berlin. Egg hunt, crafts, visits to a bear cave, playscape, bake sale and admission to the building. $8, $5 members. facebook.com/New-Britain-Youth-Museum-at-Hungerford-Park. April 20 from 10 a.m. to 11:30 a.m., and 2 to 3:30 p.m., Hungerford Nature Center, 191 Farmington Ave. in the Kensington section of Berlin. Number of eggs per child is limited. Each participant will receive a goody bag. Also, petting zoo, “bear cave” games, aviary, crafts. $8 for each participating child up to 12 years . newbritainyouthmuseum.org. April 28 from 11 a.m. to 5 p.m. Quassy, 2132 Middlebury Road in Middlebury, Opening weekend for 111th season of Quassy Amusement Park, with $45 admission per carload (up to 10 people). Price includes rides and Easter egg hunt for prizes, which is at 3 p.m. quassy.com. Editor’s note: This story has been updated from a previous version to correct the times of the egg hunts at the New Britain Youth Museum and Hungerford Nature Center.